Just painting is not all that happens in a furniture makeover. Yes, sometimes the furniture is in good shape and doesn’t need repairs or cleaning but that doesn’t happen very often. There is more to a makeover than cleaning and repairs. 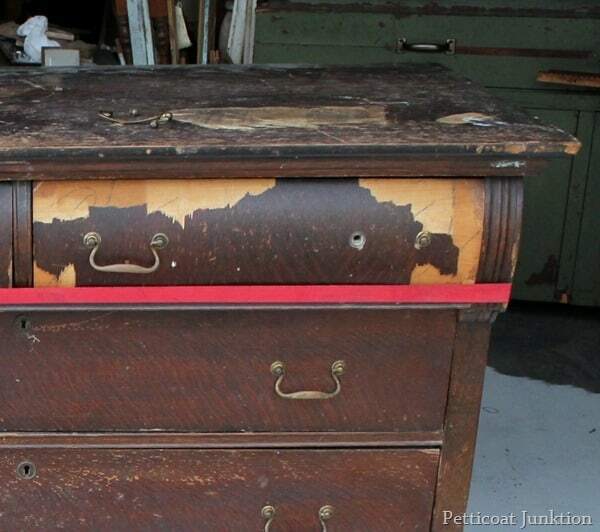 The dresser in the photo above once looked like this…..
…..before the makeover. Big difference. In my book there are 10 steps to any makeover and prepping furniture is the most important part. Step 1. Assess overall condition of the furniture. 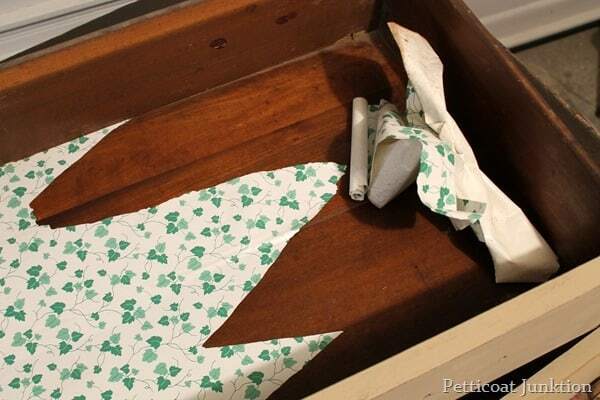 Pull out the drawers to see if they need repairs. Sometimes the sides will need a little glue or the bottom may be loose. Check to see if the veneer is pulling up. Check joints to see if they have pulled away and need gluing. Check to see that the back is firmly attached to the body of the furniture. Tes the legs to see if they are loose. Step 2. Take care of any minor or major repairs. Example of repairs: remove or replace veneer, putty holes or gashes, glue loose joints, replace missing wheels or remove all wheels, repair or replace drawer bottoms, reattach or replace drawer runners, add magnets for door closures, nail or glue any loose body parts like the top coming loose from the body, etc. The list of repairs could go on and on. Step 3. Clean all surfaces. Use a good all purpose cleaner and wipe all surfaces with a soft damp rag (not wet). Wipe immediately after with a dry rag. I don’t use oil based products. My favorite cleaning agent is Simple Green. Step 4. Decide on paint. There are more decisions to make than the paint color when selecting paint. First decide the overall look you’re going for. Do you want a flat finish, distressed, high gloss, etc. Will the piece see a lot of wear and tear? Once you decide on the look you can select the paint. Use a good quality latex paint on your furniture. Latex paint has improved greatly over the last few years. Is the hardware missing? Will the existing hardware work with the new paint finish? Do you need to drill or fill holes if replacing hardware? Step 6.Prepare drawers for the hardware. Putty and/or drill new holes for hardware if necessary. This process may not be necessary depending on the condition of the piece. I very seldom sand before painting. 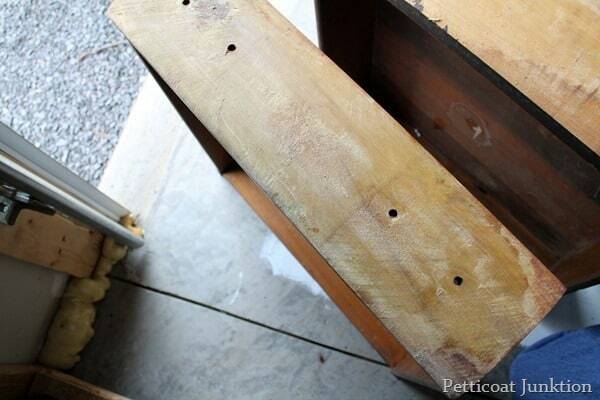 If putty was needed to fill screw holes or dings then sand the putty till flush with the furniture surface. 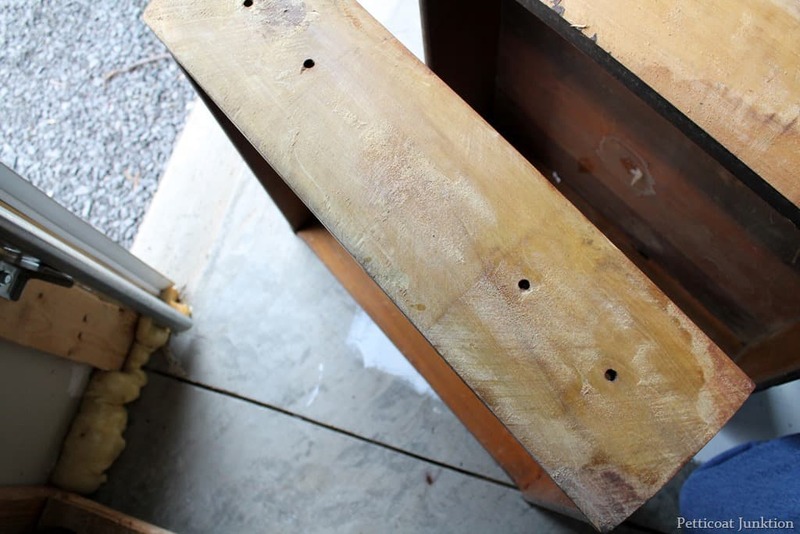 If someone has written on the piece with permanent marker, painted with nail polish, or used stickers on the furniture then sanding is required. There are some stains that will come through the paint if not removed before painting. Step 8. Prime furniture and hardware if needed. A good primer will give you an over all solid color to work with. Often used furniture is splotchy and that will show through the first and sometimes second coat of paint. Start with a solid color surface. I recommend having the primer tinted gray. Gray is easy to cover. White primer under colors such as red is very hard to cover and gray works much better. This is the fun part and usually the easiest. Prepping the furniture takes more time than painting. Start with a good quality paint brush. The brush makes all the difference. 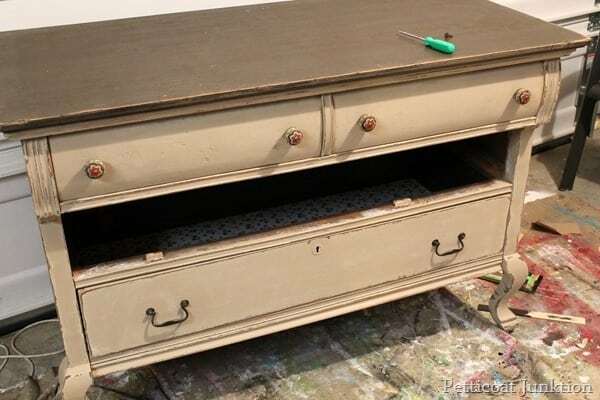 Load the brush with paint and start with the body, drawers, bottom of the furniture. Save the top for last. Seal furniture if it will see heavy use. 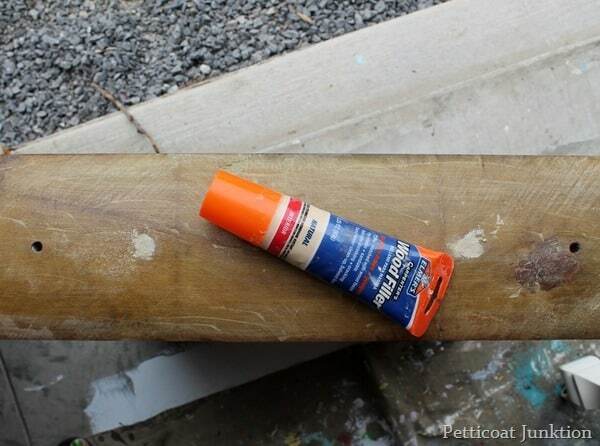 Apply 1 or 2 coats of a good latex polyacrylic sealer. ( I skip this step on most of my makeovers). So…you see…. there is more than just painting the furniture. I admit that every once in a while there will be a piece I can just paint….but that doesn’t happen very often. 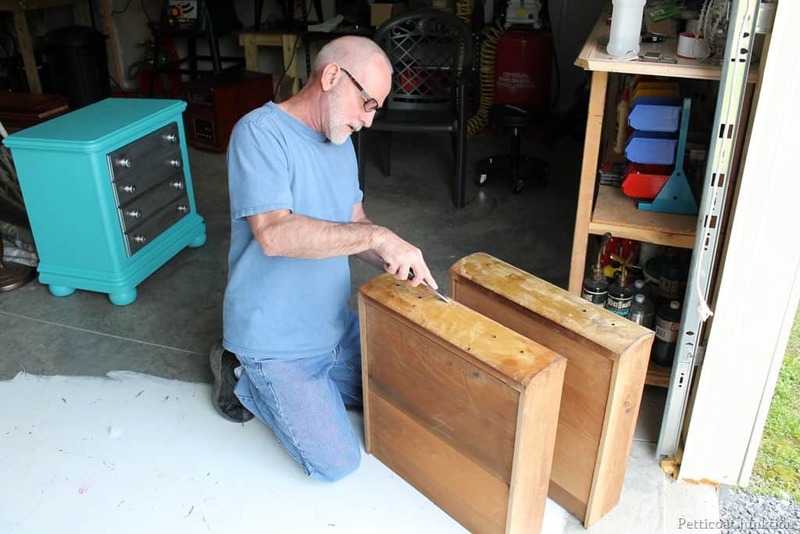 But, even if you are just painting…… the hardware and drawer pulls have to come off first and painter’s tape will need to be applied over screw holes and other areas where you don’t want splashes of paint. Now we are going through the painting and prepping furniture process on the chest of drawers in the photos above. The JTS did a great job repairing this piece and you can see all the details at Furniture Prep-Strapped & Glued. I decided the best plan for the top two drawers was to strip off all the veneer. It wasn’t very easy. I used the heat gun and tried to loosen it but the JTS said I didn’t get it hot enough. He used the glue gun and basically burned that stuff off! No, I wasn’t around to get photos of that process. There were a few stray bits of veneer and you can see the JTS with screwdriver in hand removing the little pieces. There was also a lot of tacky glue left on the drawer fronts. Instead of trying to remove it I just painted over it…more on that later. I wanted to use knobs on the top drawers instead of the pulls so I filled the original screw holes with Elmer’s Wood Filler…just leaving one hole on each side of the drawer for the new knobs. I first painted the bottom of the dresser in Beyond Paint in Off-White. I kept looking at it and thinking there was too much contrast between the off-white and the brown top. I knew the look I wanted, I just had to change plans a few times to get it! Don’t be afraid to change plans mid project. It’s just paint….paint over it if you don’t like it. I decided to go with a new Beyond Paint color….Linen. You can see the contrast between the two colors. The linen looks so dark next to the off-white but if you just look at the painted piece now…you might say it was off-white. Do you know what I mean? So the bottom of the chest has two coats of off-white and two coats of linen paint. I had a can of brown? paint from Habitat Restore but when I painted it on the top…it had a purple tint. I went to Home Depot and selected “Espresso Beans” custom mix. You can see the difference in color. A lot of you thought the top was stained…nope…just paint. The brown was still not as dark as I wanted so I applied a coat of very dark wax on the paint after it was dry. So I have two coats of brown/purple paint, two coats of brown paint, and one coat of dark wax on the top. My projects often have many twists and turns. Next came the hardware issues. I spray painted the original pulls and when I put them back on the dresser they looked so small in contrast to the new knobs from Hobby Lobby. Time to select different hardware. I went through my stash of hardware and these are the only ones that would fit the original screw holes. They were antique gold as you can tell from the one on the top right. 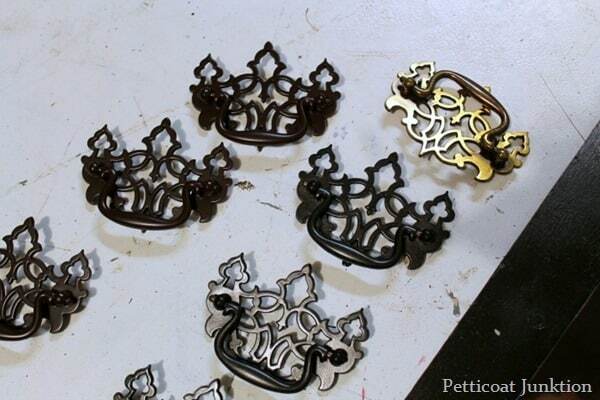 I spray painted 4 pulls in a dark metallic brown/gray. They were too dark so I spray painted 4 more pulls in a metallic dark brown. The two different colors are in the photo above but it’s hard to tell them apart. There was a major difference in color. I went with the dark brown pulls although in the photos they look black. Last but not least I removed the contact paper from the drawer bottoms. I hate when people do that. I replaced the paper with a beautiful brown print wallpaper I picked up at an antique shop. Forgot to get photos of that. Next time I go to the shop I’ll take a pic and post it here. Remember the tacky glue on the top drawers…after the first coat of paint…the paint crackled…with that cool aged effect…. and I loved it…but after 3 more coats…it was gone. Did you know you can use white glue under paint to get that crackled look? I put off writing this tutorial because it is lengthy and very time consuming as far as editing photos and writing the details. But it’s done now, yea!! 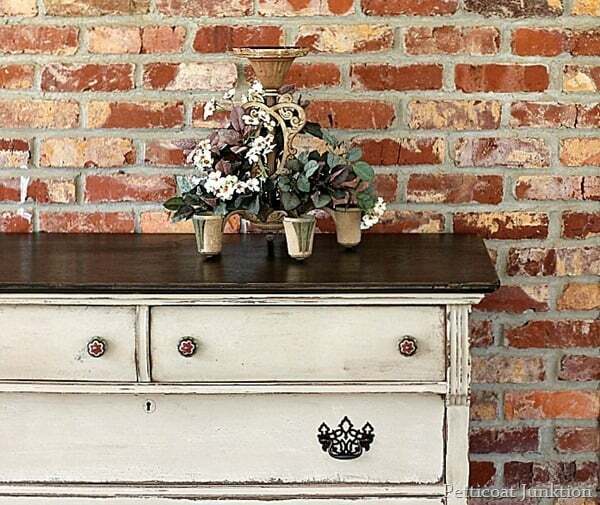 Want to learn how to give paint an antique look? Watch my video below…. Did you already guess the paint details….did you think the top was stained? Find my favorite DIY products and tools on the Petticoat Junktion Amazon Page here. 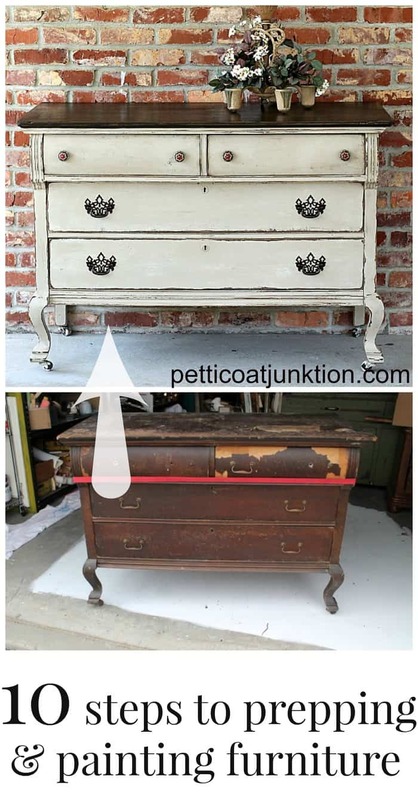 *This post first appeared on Petticoat Junktion in April 2014. It’s been updated…..I learn things or change how I do them….can you believe that? Great tutorial. I have been using chalk paint for my furniture. But I like the look of the bear paint from home depot. I will have to check into theirs. I’m looking for a little less expensive but quality paint to add to my stash. Great info Kathy, I am in process of redoing an vintage radio cabinet. It is a big job just for prep so far. It has at least 3 different colors on it. You just keep at it. Every since I saw one that you did, Thanks ! Hi! Beautiful piece, but I noticed the light fixture on top. I have two of those, one with 3 light sockets and one with 5 sockets that were the original light fixtures in my parents’ house in Texas. The house dates to 1896 and I have never seen any other fixtures like them except when I researched them on the internet. Just wanted to comment on it since I have 2 of them and just thought it was cool to see one of them actually in a picture used by a “real” person! Curious as to where you got yours? Thank you for the comment Cinnamon. I bought it at My Favorite Junk Shop a long time ago. I’ve used it around the house in different displays. Sadly the metal piece broke right in two where the sockets meet.I loved using the light fixture in displays from season to season. 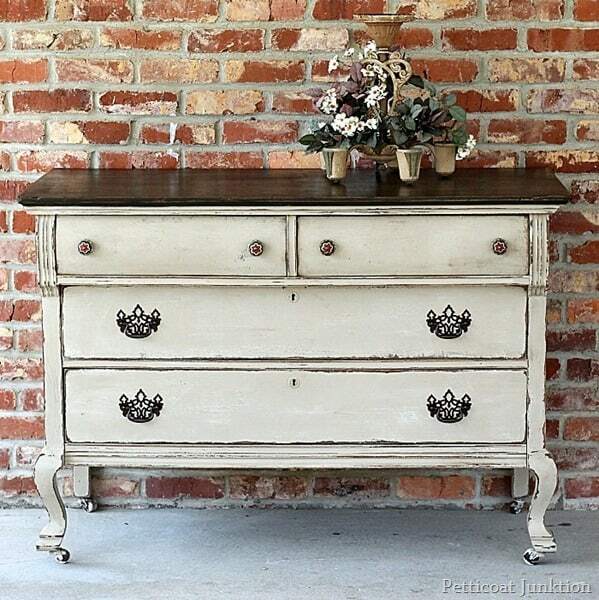 I just brought home a dresser that looks almost identical to this one last weekend! I got it from my father in law along with an old nightstand and an old cedar lane chest. For the dresser, I instantly envisioned an off white dresser with a dark stained top. I LOVE that you painted the top instead of staining it and I will be that on my dresser as well. I can’t wait! It’s just beautiful! I found you on Pinterest today while I was trying to fine a recipe for dinner lol. Thank you for your photos and time. Just really love this and for you posting this. So much more helpful than other sites!!! Think I can do or at least try this with an old sideboard. Without reading this I would not of even tried! Will purchase product tomorrow. Where do you get the Reclaim paint in linen? Home Depot? Do you have to take the vainer off all the drawers if you have to do one? I am unfamiliar with Reclaim paint is that a brand? Also I have tried sanding and distressing over latex paint. I didn’t sand of very easy. Do you have a trick? I would love to see post about how you sand and distress! Shelly, I just remove the veneer from the problem drawer. Reclaim Beyond Paint is a brand. I use an electric sander if the paint is difficult to remove. Thank you for the reminder….I do need to video or write a post on distressing furniture. Hope this info helps! Thank you for your sharing of how you paint furniture! It has helped me a lot and inspired me to get started with my furniture make over ideas. Oh I do love this! I was convinced you were using chalk paint, but you aren’t. I loved reading how you did this, and it turned out gorgeous. I just recently started painting furniture, and have been using Annie Sloan CP. I wondered what your thoughts are on that vs. other (maybe less expensive) paints? Kristy, I hardly ever use chalk paint. I know a lot of the brands are really good. I just don’t like all that waxing. There are so many fun paints that don’t require all that work. Hi Kathy–here’s a really dumb question but if you don’t mind answering, I’d really appreciate it. I bought a child’s dresser from Ikea (painted pink, not faux wood veneer) and I want it to become a powder room vanity. 1. Do I have to prime it before painting? I’m assuming it’s the usual fiberboard junk. 2. What kind of paint should I use on top of the primer? It’s for a bathroom but there’s no shower or tub and it will get minimal use. and 3. What should I use on the top to protect the paint from water drops? Thanks so much! If you answer me on your blog, could you email me to notify me? Otherwise I may forget to check your blog as often as I should . . . .
Hi Candace. It isn’t a dumb question at all! I would definitely use a primer. Some of the things they are making now are made out of “rubber wood” (really, that’s what it’s called) and it’s hard to get paint to stick to it. I use Glidden Gripper Primer and have it tinted gray. You can use just about any good brand of latex paint. As far as sealing it because of water spots I’m not sure what will help that. You might try a polyacrylic either in a spray or brush on. Don’t get the oil base because it yellows. Hope this helps! Love the way this turned out. I have a similar piece that I would like to refinish like it. 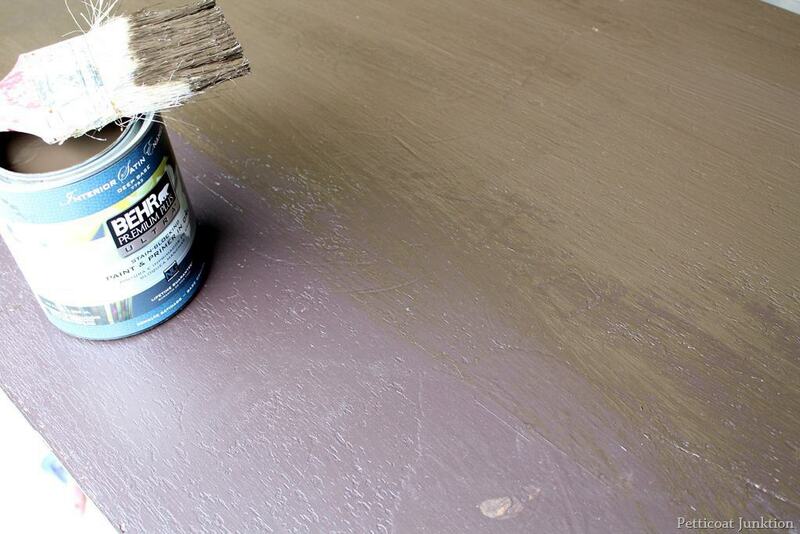 Question ~ did you put a stain, glaze or dark wax over the paint to add an aging effect? I love this chest. I will be painting a dresser for the first time this winter. I think I can follow your directions but I am not sure how to distress. Did you just use sand paper around the edges? My dresser isn’t as dark as your original color. Hopefully a brown color will show through once distressed. Is the Linen paint color from home depot also? Love this and your tips! I’m sharing this and you, as one of my favorite five today on my blog. This may sound crazy, but thank you so much for taking the time to share all of this information in a post. The hunting, prepping, painting, etc is hard, but lately I find the writing, photographing and editing even harder! 🙂 Your work is always so lovely…such a pleasure to read every post! Thank you Robin! You are so correct about the writing, photography and editing being the hardest and most time consuming. Thank you for taking the time to stop in! Beautiful work! Thanks for sharing you knowledge on working on these old pieces to give them a new lease on life! I have two questions. Where do you buy your dark wax? All I could find at Home Depot was clear wax. Also, when wooden drawers stick and are hard to open, do you know of any way of helping them slide easier? I am about to start work on a 70’s dresser and mirror that I found at the thrift store. I bought materials to make homemade chalk paint in country white. I thought this morning painting or staining the top dark would look elegant. Low and behold, I ran across this post. I am absolutely sure I want to do the top dark now. It is a veneer top. Not sure how I will stain that: I would prefer to stain it rather than paint. Briana – regarding ‘sticky drawers’ I lightly sand the bottom of the drawer that sticks and rub a cheap white unscented candle on the bottom of the drawer and along the wooden track. It will allow the drawer to slide smoothly with out staining the wood. Try looking on Amazon for hard to find stains or interesting hardware, I have the same issue my local DIY shops don’t sell a huge variety so I can find more varieties online. Hope that helps? I just came across this project – love this look!!! The paint colour is wonderful. You are awesome and all your pieces and work give a breath of fresh air. I just found you on Pinterest and I think you have the best inspirational ideas ever. Thank you for sharing your skills, taken and enthusiasm with us all. Love this piece and the choice of colors turned out just right. Since I like simplicity, were this mine I might repaint the decorative pulls the same color as the piece (and distress them as you are so good at doing). But the piece is perfect the way it is. I’m glad you found me Lola! Yep, you can still work with furniture that has veneer issues. I love this piece and am planning to do the same with a table I have here. Did you distress the linen part of the dresser after you painted or did you use dark wax on it? Thank you! I am hopeful mine will turn it out half as well as yours did!! Kate, I distressed the bottom but didn’t wax it. I applied dark wax to the top because I wanted it a little darker. Let me know how yours turns out! I am new at this but my question is do I need to put the other colors under the linen or were you indecisive about which color to choose? Also, is the dark brown wax and item the is common at Hardware Stores? I love what you did and so anxious to repeat this with my buffet! Thank you! No Shanda, you don’t have to put those other colors under the linen. I just couldn’t get my colors right! You can use Howards wax for this and it is available at some antique and hardware stores. I have a chest of drawers that has a coat of lacquer on it. Do I have to sand that off before painting or will using the primer suffice so paint will stick? 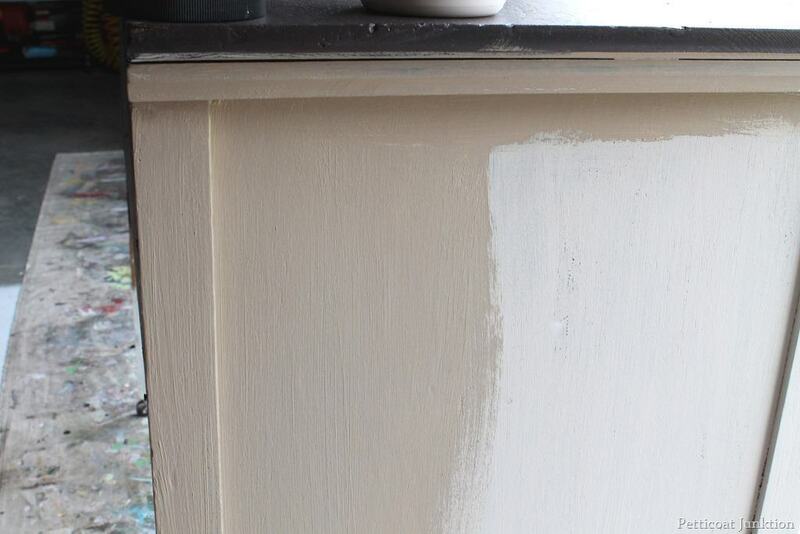 If you use a good primer…that should do it without sanding. Linda, I should add a comment to the post about the color. The photos where the color is darker were taken in the workshop under regular light bulbs which give images a yellow or darker tint. The ones taken against the brick wall were taken outside. The color may be just a tad darker than it shows. It is a creamy light beige color. I can see why you are confused! And white can definitely be too white. I very seldom use a white white. Thanks for the question. I love the dresser and the color and all the tips! I love the top handles…but those others…not so much. Thanks for sharing this post. I have a piece that I would love to redo. The veneer is peeling and I was not sure how to tackle it, but now I know. BTW, your piece looks amazing. I thought the top was stained also. That was a great step by step explanation of what it takes to really get a professional paint job. The finished piece looks terrific! This is great info! I want to try my first piece. Coming over from WOW. Thanks for sharing the details. It was so interesting to see all the steps you took to get to the completed project. There is only one thing still puzzling to me. 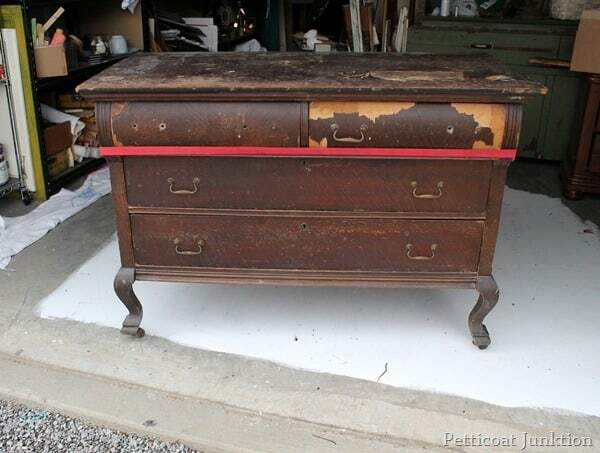 The body of the dresser appears darker in the first pics, but more off white in the last one. Did you use a milk wash to make it lighter? I love your tutorials and articles! They are always so informative. The chest turned out to be so beautiful. I plan to make it to the Nashville Flea Market next month. Maybe we can meet up in person. Thanks for sharing your work. I’m always amazed by what you have in your stash of hardware! I love the knobs on the top two drawers, they add such a pretty little pop to the piece. That turned out great. We are often puzzled by what to charge for things we re-do or make. Pricing always seems to be the hardest thing for us to figure out. Thanks for all this info. I love this look and you did a great job! As a novice painter, I can use all the info I can get to help me out. Love the top too!! Lots and lots of work to restore this piece. I understand the prices completely. You never get enough for your labor and supplies/paint costly even if you do get wholesale. Thanks for all of the details and pictures. you keep me laughing Chris…don’t ever stop commenting! Great post! I’ve been reading your blog for a while. I take my time on pieces that I redo and sometimes find it frustrating that people don’t understand how much goes into it. If I add a graphic, it can take me hours just to find the right public domain image to use, also! When you first showed pics of your purchase of this piece, I thought how will she fix this one! Love it – I thought it was Black top/gray bottom in the first pic. You’re so creative. So much work goes in to painting an old piece of furniture, but it is so worth it. Your piece is just gorgeous. Thank you for sharing.